Microprocessor Knees are one of the latest innovations in prosthetics. But exactly what are they? A microprocessor knee is a prosthetic knee with an onboard processor or aka "computer". While walking the computer monitors many different aspects of the knee, to provide a stable yet normal gait. Amputee's are now able to walk up and down ramps, and stairs more confidently with the constant monitoring abilities of the microprocessor knee. This is achieved because the processor will not allow the knee to go into free swing until certain parameters are met. These parameters vary with the stlye of knee. Below are three different models of knees and a brief description of each. C-leg. Manufactured by Otto Bock it was the first microprocessor knee to be released in 1997. 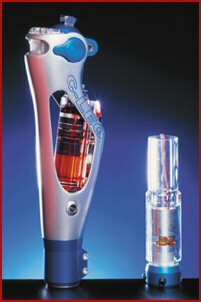 The knee has a carbon fiber frame wrapped around a microprocessor-controlled hydraulic unit. A joint angle sensor monitors knee flexion and extension. Sensors located in the pylon read toe load and heel pressure, while also reading walking speed. The software collects and reads this real time data at 50 times a second. The C-leg will not release its stance control until the knee reads full extension and 70% of toe load. 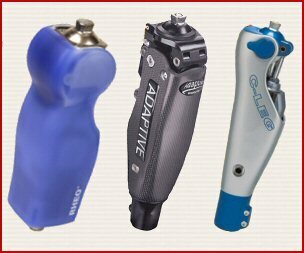 These built in stance features make the C-leg one of the most stable knees available today. Even though the knee is very stable it can be made to release inadvertantly such as attempting to walk backwards with the prosthesis first. processor has artificial intelligence capable of independent thought, it learns how the user walks, recognizing and responding immediately to changes in speed, load and terrain. These changes can then be set or recalibrated as needed. Adaptive. Manufactured by Blatchford and distributed by Endolite. Along with the Adaptive, Endolite offers the Smart IP and the IP+. All three knees employ intelligent progamming technology that dynamically programs the knees to optimum swing settings to the individual user. The Smart IP and IP+ are based on pneumatic swing control units. With the base idea that less energy is expended while walking on this type of knee. All microproessor knees require a battery to provide power and must be recharged or changed for optimum usage. Follow the specific manufacturers guidelines for battery care. Most knees will give some warning when the battery needs attention. these components and the benefits that they provide.